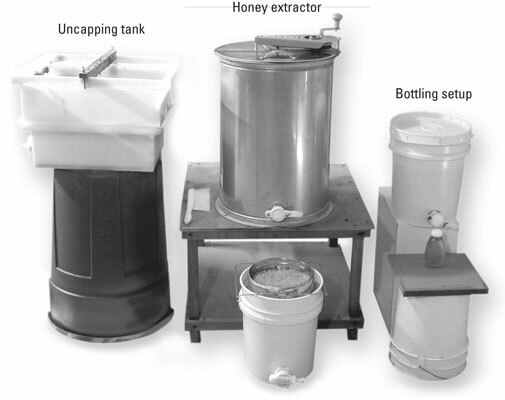 Giving some thought to where you plan to extract and bottle your honey is important. You can use your basement, garage, tool shed, or even your kitchen. You don’t need a big area. If you have only a few hives, harvesting is a one‐person job. But be prepared — you’ll likely get plenty of volunteers who want to help out. The space you choose must be absolutely bee-tight. That is to say, you don’t want any bees getting into the space where you’re working. The smell of all that honey will attract them, and the last thing you want is hundreds (or thousands) of ravenous bees flying all about. Never, ever attempt to harvest your honey outdoors. If you do, disaster is imminent! In short order you’ll be engulfed by thousands of bees, drawn by the honey’s sweet smell. Set up everything in advance, and arrange your equipment in a way that complements the sequential order of the extraction process. Have a bucket of warm water — better yet, hot and cold running water — and a towel at the ready. Life gets sticky when you’re harvesting honey, and the water is a welcome means for rinsing off your hands and uncapping knife. If you’re using an electric uncapping knife, you’ll need an electrical outlet. But remember that water and electricity don’t mix well, so be careful! Place newspapers or a painter’s drop cloth on the floor. This little step saves time during cleanup. If your floor is washable, that really makes life easy!